With a dynamically updating Today field, you can use calculated fields to make date comparisons. These comparisons are critical to setting up other smart actions and KPI indicators on the dashboard. This example describes the simple process of getting the difference between two dates using a SharePoint calculated field. 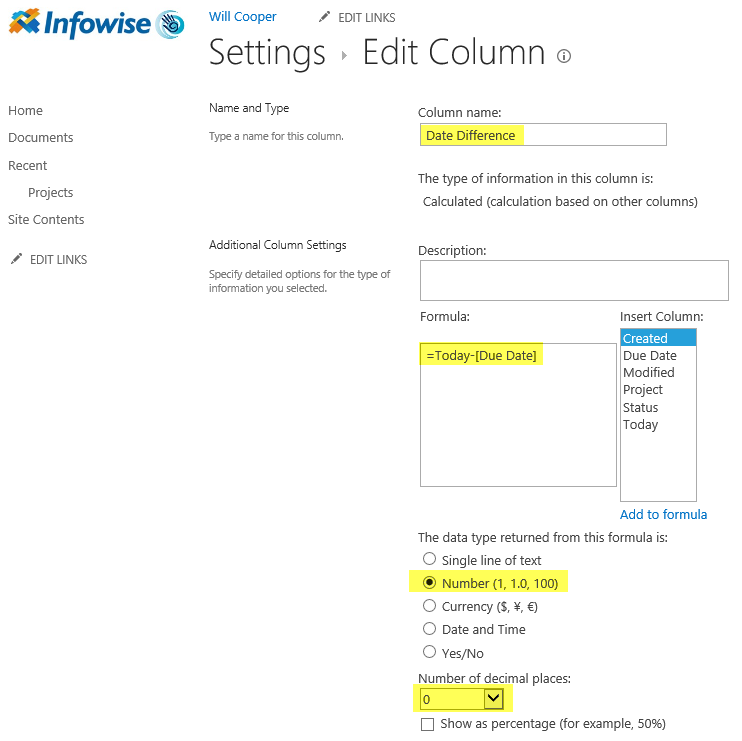 In your list settings create a standard SharePoint date and time field named Due Date. Set the field as required and otherwise use default settings. Simply subtract the Due Date value from your Today field value as shown. Tracking and comparing dates is valuable part of the recipe when it comes to building productive tools in SharePoint. Because your date comparisons will update each day, dashboards become dynamic and users will be able to quickly identify which projects are not on schedule. In more sophisticated tools, there may be a need to do many date comparisons as triggers for multiple workflows running in your custom tool.